NOTE: Conspiracy theorists have a problem with this suicide as it's just too convenient in timing and outcome. And it happens to a few people that are enemies/threats to the Clintons, at very convenient times for them. But I'm not a conspiracy theorist myself. I think coincidence is the more plausible explanation, and Vince was under a lot of stress, separated from his wife/family, and likely doing things he was ashamed of. So it hints at the Clinton's guilt to me, but not for having him killed, just their ethics stressing him to the point where he couldn't live with the guilt/shame. Another aspect is how she treated people contributed to their stress, and in the case of fragile individuals, their deaths (which happened a lot around the Clintons). Hillary's partner/friend at Rose Law firm (Webster Hubbell) is convicted of fraud, while her political advisors use their connections to fund his defense. Another Partner (William H. Kennedy) refused to release subpoenaed notes on the affair. Two year after Hillary's initial subpoena, some key documents are "found" on a table in the White House residence (that they claim they didn't know were important), that just happened to show Hillary had billed 60 hours of work for the failed S&L. David Hale (who pled guilty to two counts of fraud/conspiracy) testifies that governor Bill Clinton pressured him to make a fraudulent $300,000 loan to Susan McDougal and asked that his name be kept out of the transaction. Deputy White House Counsel Bruce Lindsey says he never sought to conceal from regulators two large cash withdrawals he ordered (that happened to benefit Clinton's gubernatorial reelection effort). FDIC inspector general's report concludes Hillary Clinton drafted a real estate document that Madison Guaranty Savings & Loan used to "deceive" federal regulators in 1986. But finally, the whole mess is dropped. Most people interviewed feel the Clintons were slimy and unethical, but there's not enough evidence to take down a President and First Lady (unless they were Republican). Hillary supporters claim not enough evidence to convict exonerates them. Their detractors think this shows what kind of people they are, and the company they keep. "they could not find evidence of the First Couple’s involvement or awareness in Madison Guaranty-related fraud" but that, "doesn’t necessarily mean that ... the evidence exonerates anyone, it simply means that no basis has been found to sue anyone." "the RTC had grounds to sue Rose Law Firm for failing to disclose conflicts of interest that could have damaged the RTC, though a lawsuit wouldn’t be cost-effective"
the records show that Hillary Clinton "performed more services for Madison Guaranty than previously known" and "The billing records ... directly contradict Mrs. Clinton’s claim that her role on the matter was merely to serve as a ‘backstop.’ " (e.g. she'd lied and not disclosed a lot, which might have been perjury, but no one pursued that). The AP wrote an article in 1996 that strongly disagreed that she was "exonerated". 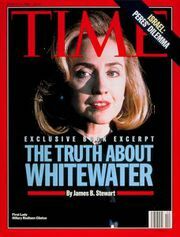 David Bossie, a former Whitewater investigator pointed out that Whitewater resulted in Bill Clinton’s impeachment and 16 related convictions, "the idea that Hillary Clinton was ‘completely exonerated’ is not true,"
So the fact checkers avoid the bigger topic that it was another mess/scandal, with 16 convictions, tons of illegality and corruption, Hillary lied, lost records, had shady ties, questionable ethics, and a lot of double dealing by friends of the Clinton's. She's often in these messes, which says something whether she keeps getting "exonerated" or not. But again, the lie of omission is in picking nits, parsing words and ignoring the bigger truths. This page was last edited on 14 April 2019, at 21:39.